Rhonda, Tom, Liz and Miguel all have 4 shells. If they each find 1 more shell, does the mode change? If so, what is the new mode? – Page 64, Macmillan/McGraw-Hill “California Mathematics,” Second Grade. Big Guy’s class was on Chapter 4, Lesson 6: Range and Mode. At least we’ve gotten past last year’s gripe, which was that the math questions were far above the level at which most first-graders can read. This week’s shell passage comes out to a 1.03 grade level on Flesch-Kincaid readability index. So the words are simple enough. But let’s look at the number of steps needed to calculate the answer. It’s a good thing it was the last question – it’s a lot of work for a kid. Add 4 shells plus 1 shell. 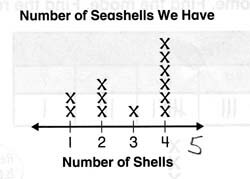 Subtract four people from the category of 4 shells. Create a new category – 5 shells – and move Rhonda, Tom, Liz and Miguel into that category. Calculate the new mode. And, yes, I had to Google that one, because I’d remembered range, mean and median, but not mode. The next part of the question involved figuring out the range, and that’s a three-step process. Granted none of the calculations is hard, even for a second-grader. But math problems for 7-year-olds that involve three or four steps? Concepts such as mode and range? Wow. In second grade, I was barely learning to add and subtract. Next week, Big Guy will be starting two-digit addition. At least, unlike “mode,” I remember how to do that. That was the biggest problem I had with yesterday’s lesson. In order to teach, you have to over-learn something so that you can explain step-by-step how to do it. I’m afraid most of the math I ever learned flew out of my brain 20 years ago. Plus there’s the additional challenge of breaking down a four-step problem for someone who’s currently trying to master walking and chewing gum. There’s no question in my mind that I had to break it down for him. He hadn’t completely grasped “mode” and “range,” and he’s still climbing the learning curve on following written instructions. And I’ll admit that the way I “break it down” is painful to both of us because I refuse to tell him how to answer it. We keep reading and analyzing the sentence, writing and rewriting equations, until he gets it. Will he get it? Yes, in time. Even in an era of the mantra of “everyone ready for algebra by eighth grade” and when we have to keep up with those genius children in other countries, though, I still have to wonder if it’s too much, too soon. I remember watching my daughter being exposed to statistics, much as your child is now. With “spiraling” math they return to this subject again and again, at a higher level, until they achieve some kind of mastery. The problem is that they’re too young to understand and use statistical analysis in its proper context as a research tool in elementary school, and they never do even as they get older. OMG, that makes my brain hurt. I tell my kids I’m a writer, not a mather. We’ll hire a tutor if you need help.